Researchers have discovered a new geometric shape that's been hiding in plain sight. Researchers have discovered a new geometric shape that's been hiding in plain sight. A team studying the cells that give rise to embryos and can be found lining our organs and blood vessels pinpointed a three-dimensional shape that occurs as they bend and pack together. The new shape, dubbed the scutoid, allows these epithelial cells to organize with the most efficiency, as opposed to the column or bottle-like shapes scientists previously attributed to this process. Epithelial cells are the building blocks of embryonic development, and must endure the twisting and packing that happens as organs form. In the new study, the researchers found the process relies on a previously undescribed shape, allowing cells to maintain maximum stability while conserving energy. To get to the bottom of its nature, the researchers used computational modelling based on Voronoi diagramming. 'During the modelling process, the results we saw were weird,' said Javier Buceta, from Lehigh University. The team analyzed the three-dimensional packing of tissues in different animals, and found they adopted shapes predicted by the model. 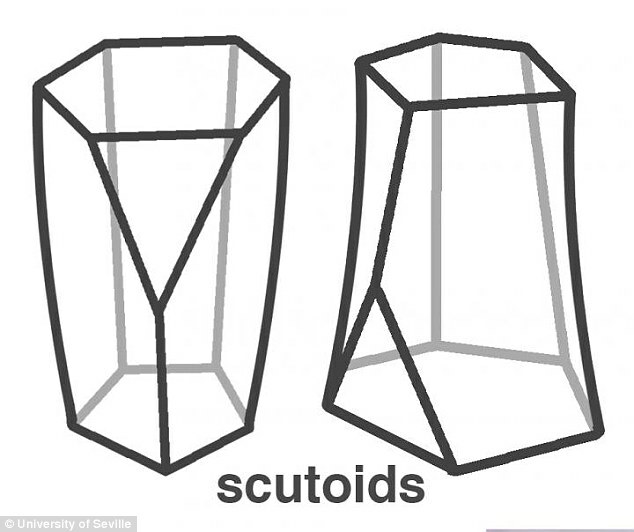 They're calling the newly identified shape the scutoid after the shield-like scutellum of a beetle's thorax. 'We have unlocked nature's solution to achieving efficient epithelial bending,'' Buceta says. According to the researchers, the shape makes for the most energy-efficient method of cell organization.